I wish one day I'll be able to witness this! This is just too beautiful to miss. God's creations are just too great. And this is just a picture. Stumbled upon this picture randomly somewhere on the internet..
~~~Auroras, sometimes called the northern and southern (polar) lights or aurorae (singular: aurora), are natural light displays in the sky, usually observed at night, particularly in the polar regions. They typically occur in the ionosphere. They are also referred to as polar auroras. In northern latitudes, the effect is known as the aurora borealis, named after the Roman goddess of dawn, Aurora, and the Greek name for north wind, Boreas by Pierre Gassendi in 1621. The aurora borealis is also called the northern polar lights, as it is only visible in the sky from the Northern Hemisphere, the chance of visibility increasing with proximity to the North Magnetic Pole, which is currently in the arctic islands of northern Canada. Aurorae seen near the magnetic pole may be high overhead, but from further away, they illuminate the northern horizon as a greenish glow or sometimes a faint red, as if the sun was rising from an unusual direction. 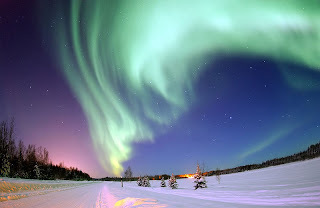 The aurora borealis most often occurs from September to October and from March to April. The northern lights have had a number of names throughout history. The Cree people call this phenomenon the "Dance of the Spirits." Aurorae can be spotted throughout the world. It is most visible closer to the poles due to the longer periods of darkness and the magnetic field.